Flying Squirrel Boxing Productions Presents. . .THE KO Picture Show! "Reviewing the best (and worst) in Pugilistic Pictures!" "The Best Picture of '76. It's no "Stop! Or My Mom Will Shoot! ", but it's one of Sly's better efforts." Legend has it that Sylvester Stallone was inspired to write the screenplay for Rocky after watching a 1975 fight between Champion Muhammed Ali and an unknown challenger named Chuck Wepner, "The Bayonne Bleeder". Wepner managed to surprise the champ with his tenacity, even scoring a flash knockdown in the 9th round, before Ali pounded him into submission in the 15th. Stallone took this idea of a complete unknown getting a shot at the title and managed to create one of the most memorable films, boxing-themed or otherwise, of all time. Rocky Balboa (Stallone) is just a club fighter, a "ham-and-egger" as he describes himself, who fights for small change when he's not out breaking legs for a local loan shark. He seems content to live a life of anonymity, just some loser from the streets of Philadelphia. 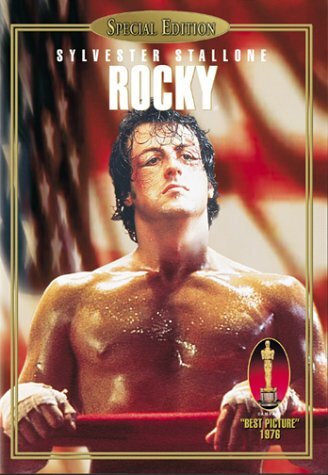 He's joined in this life by fellow underachiever Paulie (Young), an alcoholic who works at a meat packing plant, but aspires to get to Rocky's "glamorous" station in life. When I run down the cast of characters in this movie, it's absolutely amazing how such an inspiring movie can contain so many sad examples of humanity. Aside from Rocky and Paulie, there's Mickey (Meredith), the cantankerous boxing trainer who sees Rocky as a bum who never realized his true potential; Gazzo (Joe Spinell), Rocky's mob-ish employer who implores Rock to follow through on his threats of physical harm when people don't pay up; and of course Adrian (Shire), Paulie's extremely shy sister who Rocky has a crush on. The beginning of Rocky's relationship with Adrian coincides with an absolute stroke of luck; the current heavyweight champion of the world, Apollo Creed (Weathers) has his latest title fight fall through, so he and his promoters come up with the idea of giving a complete unknown a shot at the title. After a search for what should be a pushover of an opponent (as well as the acknowledgement by Creed that putting a white guy on the card never fails to sell tickets), they arrive on "The Italian Stallion", Rocky Balboa. And so the movie follows the development of these 2 circumstances in Rocky's life, the love story and the build-up to the fight with Apollo Creed. While many see the training and the eventual fight as the most inspiring parts, it's the dependency and trust that develops between the aforementioned "dregs of humanity" that gives you that warm fuzzy feeling. Rocky's love for Adrian; Mickey's eventual belief in Rocky; Paulie's need for acceptance from Rocky; all of it moves the story forward in a positive way. But let's be serious. . this movie wouldn't have made a dime if it was just a character study. . it's the stroking of that adrenaline gland that put the butts in the seats back in 1976 and has people still cheering the film today. Bill Conti's "Rocky's Theme" should be up on the soundtrack "Mount Rushmore" beside the music from "Jaws" and "Raiders of the Lost Ark". It never fails to give me goose bumps and make me want to go charging up a flight of stairs! It's the classic tale of an underdog prevailing against all odds. That coupled with some fantastic performances (Meredith, Stallone, and Weathers are perfect in their roles, hitting all the right notes) makes for a spectacular experience. The only misteps that I could see were by Young and Shire. Young's portrayal of Paulie had it's moments, but the more emotional scenes tended to elicit giggles more than anything else. Paulie was more effective in the quieter moments, with less drooling and facial contortions of rage. Shire's Adrian was as understated as Young's Paulie was ham-fisted. To the point of wondering, "does she actually like Rocky, or is she just going along for the ride?" To be thruthful, this could be pinned on Stallone's script more than Shire. And it should be noted that Young and Shire were both nominated for Oscars for their performances (along with Stallone and Meredith), so what do I know. These are minor problems though. This is a must see for boxing and movie fans alike. All of the elements of boxing shown in this movie, from the training montages to the ring entrances, are completely authentic. And even the technique and mannerisms that Rocky and Apollo display as they approach each other in the ring is impeccable. Then Apollo throws that first jab, and it all goes out the window! THEY NEVER MISS! Every shot thrown is a potential knockout punch, and every one of them sounds like someone is slapping 2 pork chops together off-screen! Both Stallone and Weathers make for credible looking boxers, but the foley guy could have definitely dialed it back a little. There's really not much more to say about this movie. It inspires me, and many others apparently, to tears whenever we hear that familiar song during the famous Rocky training montage. The over-acting of Burt Ward and the "beyond wall-flower" performance of Talia Shire are the only parts that detract from this one for me. It's one of those rare films that received both critical acclaim and box office success, and deservedly so. It also spawned 4 sequels (to date), but that's a subject for another review.